► To arm: lock the vehicle with the SmartKey. Indicator lamp 1 flashes. The alarm system is armed after approximately 15 seconds. ► To deactivate: unlock the vehicle with the SmartKey. If you then do not open a door or the rear door, the alarm system switches back on again after approximately 40 seconds. ► To stop the alarm: insert the SmartKey into the ignition lock. The alarm is switched off. 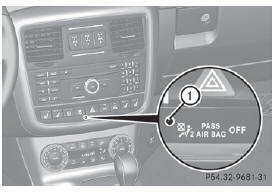 The alarm is also triggered if: • the position of the vehicle is changed. • a window is smashed. The alarm is not switched off, even if you close the open door that has triggered it, for example. If the alarm stays on for more than 30 seconds, the Tele Aid system automatically initiates a call to the Customer Assistance center. The mbrace emergency call system initiates the call if: • you have subscribed to the Tele Aid service. • the Tele Aid service has been activated properly. • the required mobile phone, power supply and GPS are available.